Foliage TypeEvergreen shrub with glossy, dark-green leaves with ruffled edges on willowy stems. Flower FormStar shaped, sweetly scented white flowers. PruningPrune back in the spring to keep it bushy and full. Winter CareHardy in zone 9-10. Other zones should be grown as a houseplant. 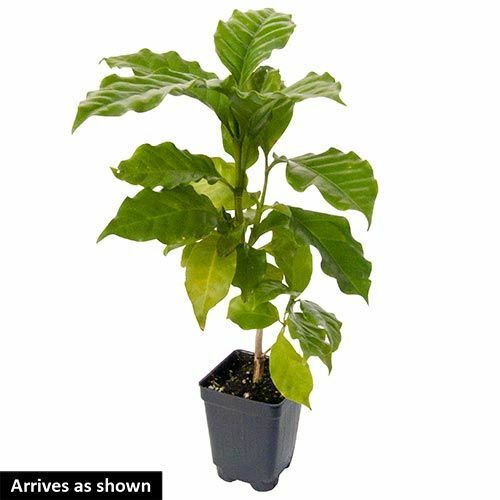 Grow coffee plant indoors with average room temperatures 60-75 degree. Additional InformationWhite flowers will be produced in 3 to 4 years. The flowers are followed by green fruits which change to red then to black when ripe. This process takes a couple of months. 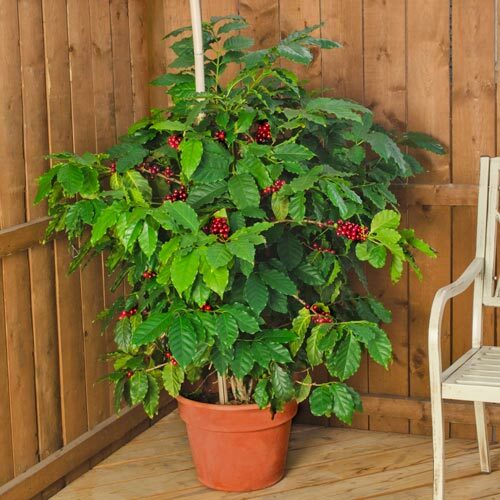 Inside the ripened fruit are 2 seeds that can be roasted and ground to make coffee. Planting InstructionsSet plant at the same soil level it is at in the container. Firm soil around plant and water thoroughly.